The cost to drill a well in Chilliwack is available to you online. Are you preparing to drill a well in the Chilliwack area this year? We provide property owners quick access to the current Chilliwack Well Drilling Costs without the need for a prior sales visit to your property. Request a DETAILED well drilling estimate online, you may also want to take a moment to read the Chilliwack Well Drilling FAQ. The following form is provided to help Chilliwack Well Drilling create a complete detailed well drilling estimate. Prior to providing an drilling estimate we research and rely on comparable information that may be available about other drilled wells in your area in addition to our local drilling experience. Please submit your information, we'll respond fast. Your information is private and helps up provide a detailed well drilling price for the current 2018 Chillwack Well Drilling Cost. 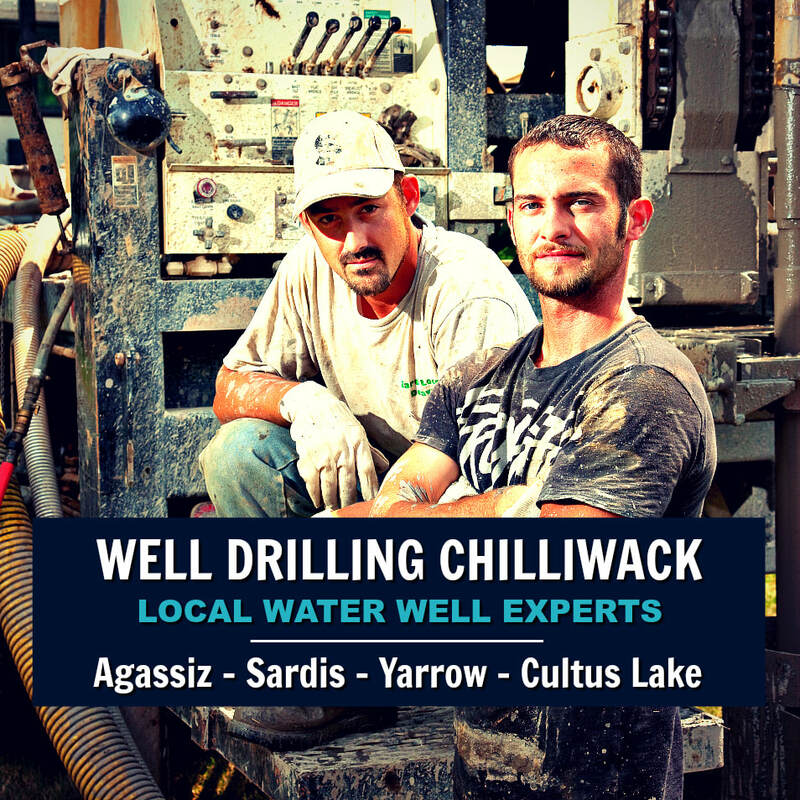 Chilliwack Well Drilling specializes in water well construction throughout the Fraser Valley. Drilling quality water wells in our local service are including Chilliwack, Bridal Falls, Chilliwack River Valley, Columbia Valley, Cultus Lake, Chilliwack Mountain, Fairfield Island, Greendale, Kent, Little Mountain, Popkum, Promontory Heights, Rosedale, Ryder Lake, Sardis, Sumas Mountain, Vedder Crossing, Yarrow, Hope & Merritt. Chilliwack Well Drilling offers outstanding water well service; an can complete all water well projects regardless of size or complexity. Water resources through-out the Chilliwack Valley is one of the most coveted natural-resources. Accessing water in the Chilliwack aquifers requires high-precision drilling to avoid potential water well problems. We focus on local well drilling and Chilliwack Well Drilling performs to meet water well needs for residential, commercial & industrial water well demands. Chilliwack Well Drilling FAQ is a local well drilling guide of information that is commonly ask by others who are preparing to drill a well in the Chilliwack area, please take a few moment to read over the following information. Chilliwack Well Drilling FAQ: What is the well drilling cost? To get an accurate well drilling price to drill a local well contact Chilliwack Well Drilling with the property address to receive a drilling estimate for the well drilling cost in Chilliwack are surrounding area. Chilliwack Well Drilling FAQ: Are permits required in Chilliwack? When drilling a residential water well in Chilliwack a well drilling permit is not required at this time when drilling for water BC. Chilliwack Well Drilling FAQ: How long will is take to drill a water well? Most Chilliwack water wells are completed within a day or two once we are on site and set-up. Chilliwack Well Drilling drills year-round but the property needs to be dry enough to access with a well drilling rig. Winter can be a great time to drill for water and the waiting period is usually reduced considerably if the property is accessible during the wet months. As we proceed into summer the water well drilling rigs book-up quickly leading to longer waiting periods to drill for water in Chilliwack. Chilliwack Well Drilling FAQ: Where should I drill my water well? Chilliwack Well Drilling will arrange to visit your property to determine the best potential drilling site. We will do all that's possible to help you locate the best possible location for your new water well. Each area is different, please feel free to call our office for local well drilling information. Most well drillers randomly choose a well drilling site, in some areas random drilling might be successful but other areas random drilling can also result in a very high-percentage of dry-holes or low yields. We're transparent with everyone, we often suggest consulting an expert who is excellent at siting water wells when drilling for water in some areas of the upper Fraser Valley when necessary. Not all drilled wells in Chilliwack are deep, many of the drilled wells are far less than 200' deep. If a well is drilled near a possible source of contamination it may be vulnerable and become contaminated. Chilliwack Water Well Regulations - Ministry of Environment set-backs for water wells through-out the Fraser Valley communities are required to protect our valuable water resources from contamination from a multitude of possibilities. To understand local comparable well drilling depths in the area, it's best to refer to the well drilling reports for Chilliwack on the BC Wells Database or contact our office and we are happy to help you will the local water well drilling information. Possible sources of contamination include waste dis-charged to the ground, such as privy vaults (also known as an out-house or pit-toilets), cesspool (“over-flow” pits), septic tanks and effluent fields, stable or pig sty, manure-heaps, fertilizers and pesticides, under ground storage tanks, run off from urban areas, cemeteries or landfill sites etc. 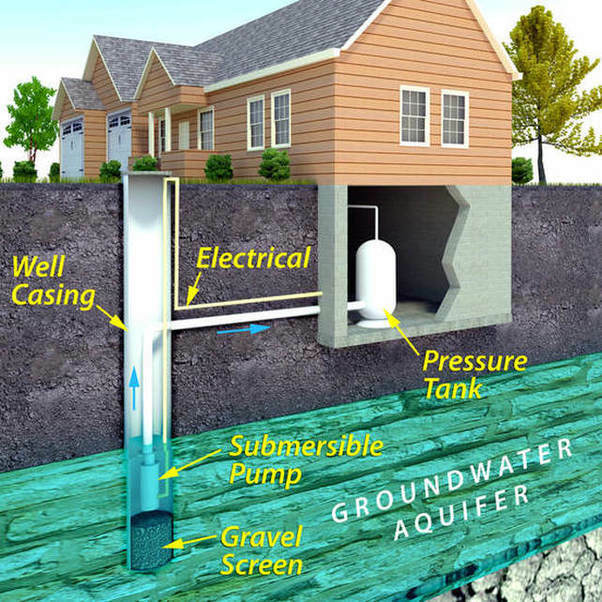 Water Wells should be constructed on higher-ground to protect a well head from normal or seasonal flooding and possible surface drainage contamination. Chilliwack Well Drilling FAQ: How deep will my drilled well be? The normal depth of a drilled well in Chilliwack is between 60 - 250'. However, well depth cannot always be accurately determined prior to completion of drilling. The depth of local water wells will differ from from one property to another. We carefully research an area prior to writing a quote for the cost to drill a well in Chilliwack. Chilliwack Well Drilling FAQ: Is there a guarantee that we will have water? There's never a guarantee of hitting water when drill a water well, however when drilling into a Chilliwack aquifer most wells are successful. The amount of water that a well will yield is highly-variable and not determined prior to drilling for water. Well drilling is a significant investment for most property owners, we do all that we can prior to drilling to protect our clients from unexpected well drilling difficulties. We do not support the practice of deep-holing when drilling in the Upper Fraser Valley and work in the best interest of our local clients. Chilliwack Well Drilling FAQ: How much water should I expect from a well? Wells in Chilliwack and the neighboring communities typically produce from 2 to 100-gallons-per-minute. Sometimes yields as high as 300-gallons-per-minute have been achieved but not typically. Approximately 5 to 15 % of water wells drilled in the Chilliwack Valley may produce less than two-gallons-per-minute. As with depth, the amount of water that a drilled water well in Chilliwack will yield is highly variable and likely will not be determined prior to the completion of drilling. With correct research and extensive local water well experience we can often provide the average water well quantities for many of the surrounding Chilliwack communities. Chilliwack Well Drilling FAQ: Can I expect good water quality from a local well? The water quality of many drilled wells in the Chilliwack area does meet the Canadian Drinking Water Guidelines. We always recommend that all wells be tested annually for contaminants. Chilliwack Well Drilling will assist or advise on related water well services such as water pumping packages, water testing and treatment or water filtration. As a community we must focus on adopting preventative water well practices and measures, it's a critical first-step in mitigating the possibility of contaminates that may be released near a water well. As a well owner in Chilliwack it's very important to protect and understand the vulnerability of the Chilliwack water supply to human-changes and improper land use practices. Where is the Sardis Vedder Aquifer located? The location of the Sardis Vedder Aquifer is shown in the diagram. The vulnerable areas is indicated by the colour coding, red being the most vulnerable area followed by the pink area then the green area. Fresh ground water is becoming a scarce resource thorugh-out the world. One main reason for this scarcity is the in-flux of chemicals and biological agents into an aquifer which adversely affects the quality of water. The detrimental factors are derived from man-produced point and diffuse sources. The main causes of contamination concern are harmful chemical-compounds such as salts of heavy metals, organic substances, along with possible disease causing bacteria and viruses. These materials, generally referred to as "contaminants" or "pollutants" can persist and remain present in sub-surface waters even after passing through natural-filters like calcareous vadose (unsaturated) zones. Clean & safe ground water in Chilliwack is a valuable resource and is fundamental to our everyday life and our economic well being. Ultimately, survival depends on our protection of our aquifers. The water-supply for the Chilliwack District is received from the Sardis Vedder Aquifer. The Sardis Vedder Aquifer is composed of a large alluvial fan formed by the Chilliwack River where the river exits the Cascade Mountains. Because of the permeable nature of the soils over laying the Sardis Vedder Aquifer, contaminant migration into this ground water resource is a concern. If an aquifer does becomes polluted, recovery is typically very difficult, even impossible to restore an aquifer back to it's natural state depending on severity. If an aquifer pollution is "severe", it may be technically impossible to restore an aquifer to sound conditions. For example, cleaning sites where water contains insoluble constituents, such as jet-fuel would require thousands-of-years. Agricultural activities have been implicated as a primary cause of elevated nitrate concentrations in Fraser Valley groundwater resources. In addition to animal manures, application of chemical fertilizers and pesticides by the agricultural industry can represent a significant threat to groundwater quality. Septic-systems are another common source of groundwater pollution, contributing bacteria, viruses, nitrates, detergents, oils and chemicals to groundwater. Ground water contamination from septic-systems results in situations where septic-systems are poorly sited, designed or constructed, where septic systems are poorly maintained, or where septic-system densities are too high for capacity. One of Chilliwack's greater interests is the safety of drinking water and protection of the Sardis Vedder Aquifer. We can all protect the local aquifer by taking the correct measures to prevent chemical and waste spills by ensuring that all hazardous-materials are transported, stored, and disposed of correctly, and by working with our neighbors to minimize dangerous land use activities that may pose a risk to our ground water resources. How could the Sardis Vedder Aquifer become contaminated? Aquifers are composed of permeable layers of rock, sand, or gravel that enable surface waters, including streams, rivers and precipitation, to percolate into the ground and recharge ground water resources. The Sardis Vedder Aquifer is particularly vulnerable to pollution for several reasons. First, the upper-layer (sub-surface) of groundwater, the water-table, lies only a shallow five to ten meters below the ground’s surface. This is important, as chemicals or waste-materials must travel only a short distance through the soil to impact the ground water quality. Secondly, the boundary layer of soil that protects the ground water from the upper-surface is coarse grained and consequently extremely permeable. Rainfall rapidly seeps through the pores of the coarse soil, carrying pollutants from the surface to the aquifer below. The upper Fraser Valley receives abundant rainfall, particularly during the winter months, preventing the entrance of contaminants due to surface-spills is vital to the protection of the Sardis Vedder aquifer. Chilliwack Well Pump FAQ: What type of water well pump do I need for my well? We will need your Chilliwack water well information before a well pump system can be accurately sized and designed. The type and size of a well pump is decided by the depth and flow-rate of a water well. Water pumping system design will also determine the required pressure-system and other variables. Typically with a drilled well a submersible-pump and motors will be installed approximately 10' from the bottom on a well. Chilliwack Well Drilling also has a team of well pump experts. Well pump professionals are not to be confused with well drillers, we do focus on offering complete water systems to our clients. Our Chilliwack Well Pump experts will design the best water pumping system to fit your water requirements. Many Chilliwack area property owners prefer our full service water system program, we're experts at managing well drilling projects from domestic water wells to the large diameter systems. We manage the well pump installations and complete water systems from scratch regardless of size. Chilliwack Well Pump maintains affordable water well services, call us to learn more about our one-stop-shop today! Call us today or request an online quote for local water well pump service, well pump repairs, water well repairs or well drilling in Sardis. Chilliwack Well Drilling - Fully equipped to complete all well drilling projects regardless of the project size or requirements. We're one of the most specialized companies in the British Columbia well drilling industry. Locally, we are the #1 experts in residential water well drilling, commercial water-system projects, and large diameter production-wells for the agriculture sector throughout the Chilliwack and the neighboring communities. Our multi-skilled well drillers are prepared to drill for water in any formation, with the ability to set-up for drilling throughout remote areas where conventional rigs and drilling equipment may not be able to access. We can also gain quick access with Heliport-able HT-500, HT-700 and HT air-compressors. No problem with handling the largest of an drilling project either, with DR-24 Barber drilling rigs and the ability to drill from 6” to 22” diameter boreholes with depths exceeding 1,000'. Chilliwack Well Pump & Well Pump Repair services the entire Upper Fraser Valley including Upper Fraser Valley including Chilliwack, Bridal Falls, Chilliwack River Valley, Columbia Valley, Cultus Lake, Chilliwack Mountain, Fairfield Island, Greendale, Kent, Little Mountain, Popkum, Promontory Heights, Rosedale, Ryder Lake, Sardis, Sumas Mountain, Vedder Crossing, Yarrow, Hope & Merritt. If dealing with an aging well pump system and experiencing well pump concerns, it could be time to consider a well pump replacement. The best time to replace an existing well pump is prior to it becoming a well pump emergency. Don't wait for your water pump to become an expensive well pump repair in Chilliwack. When well pumps quit pumping water it's not only costly but generally untimely and even more so if it's on a holiday or week-end! We specialize in designing all types of water pumping systems including, submersible well pumps for Chilliwack wells of all depths, shallow well systems, booster pumps, jet pumps, irrigation pumps, sump pumps, sewage pumps, pressure tanks and, pressure switch replacement. We will sort out low water pressure issues, storage tanks, water cisterns, water filtration systems and rain water systems. Chilliwack Water Well Services includes water-line repair or recovery, pressure tanks and more. If your well suddenly goes dry, give us a call for advice. We are here to serve the water well needs of the Chilliwack families and businesses. Ready for a new Water Well Pump in Chilliwack? Is your current water well pumping system getting tired? Perhaps time to do a pump replacement. Consider doing a water well pump replacement during the winter months or early spring, there's no reason for water well pump replacements to wait for summer. Our upper Fraser Valley weather is generally mild enough for our well pump crew pump installations throughout the entire year. Once the summer months heat-up in Chilliwack there's a relentless demand for well drilling and water well services in the Chilliwack Valley. If you are waiting to replace an aging well till summer it can involve increased well pumps costs and frustrating wait times, the demand for new pump installations and water systems increases substantially. If you would like to schedule for well pump replacement in Chilliwack, give us a call or request a FREE well pump replacement quote online. We represent reputable water well equipment including quality well pumps such as Franklin Electric motors, Grundfos Pumps and other brands to meet all local needs and budgets in Chilliwack. We very experienced at well pump selection, sizing and the custom design of complete-water-systems that meet all requirements. Chilliwack Well Pump specialists are fully qualified and eager to serve you! Local Well Pump Experts have service vehicles that are prepared along with certified well pump installers, maintaining a broad inventory of well pumps and water system supplies for pump installations and well pump repairs in the Chilliwack Valley. We take pride in arriving on-site prepared take care of sudden well pump problems. Our professional well pump team is seldom called to a job only to leave a property-owner waiting while they run around trying to locate the required equipment or fittings to complete your well pump project. Call Chilliwack Well Pump or request an online well pump quote, we respond quickly to online requests! Chilliwack Well Drilling experts know the importance of water well-screen design, careful selection of a well screen is, without doubt, the most important consideration when constructing a long lasting and efficient water well. A properly selected well screen is designed to serve two basic purposes: to allow the un-obstructed entry of clean water free from sediment into the well, and to permit a maximum flow to the formation for water well development procedures. Call Chilliwack Well Drilling today or request a FREE online well drilling estimate for drilling in the Chilliwack area. BC Ministry of Environment WELLS Database for Upper Fraser Valley including Chilliwack, Bridal Falls, Chilliwack River Valley, Columbia Valley, Cultus Lake, Chilliwack Mountain, Fairfield Island, Greendale, Kent, Little Mountain, Popkum, Promontory Heights, Rosedale, Ryder Lake, Sardis, Sumas Mountain, Vedder Crossing, Yarrow, Hope & Merritt. 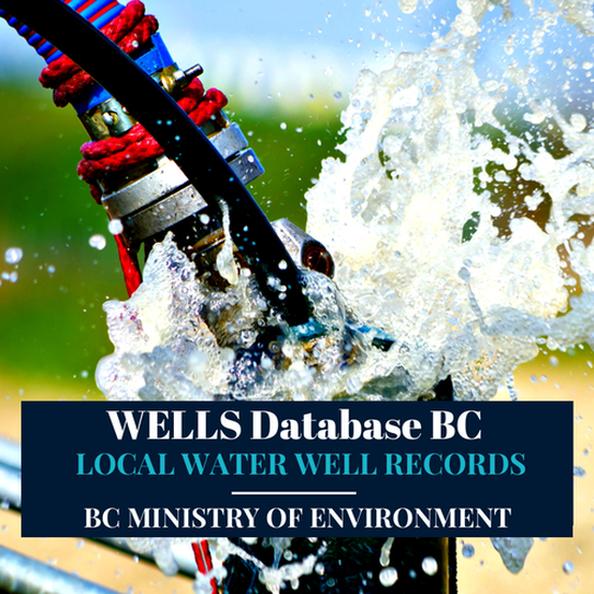 WELLS Database Chilliwack, well drilling regulations and Chilliwack Groundwater protection is regularly updated and managed by the British Columbia Ministry of Environment. The provincial government's iMapBC for Chilliwack is an important online portal to a wealth of open government data for the Upper Fraser Valley. A valuable water resource, WELLS Database is a self-serve online system, free of charge - available for public use, it you need any help please feel free to contact our office, we are available to help or answer questions. Along with the Water Well Regulations for Chilliwack and the Water Well Search Tool, you'll find the provincial land use requirements, setbacks, Fraser Health Authority, BC Water Rights Database and other important water resources and reports to download. Chilliwack Well Drilling provides local Well Drilling Regulations for the Upper Fraser Valley; Canadian Drinking Water Guidelines, BC WELLS Database and the BC Water Atlas for Chilliwack and the Upper Fraser Valley.